Step back in time and experience a peaceful, private Hawaiian lifestyle at this one of a kind beach house located on a million dollar beach front lot. This home has over 3,100 spacious square feet of living space. The 6 bedrooms surround the large courtyard with a private pool, creating a very unique layout. Two of the 6 bedrooms are connected to the main living quarters while the rest have private locking doors leading from the room to the courtyard and then into the main portion of the home. This gives the ultimate indoor/outdoor living experience. Bedrooms 3 and 4 share a Jack and Jill bathroom while bedroom 5 boosts the largest space and where the dry sauna is located. The smallest of the rooms is bedroom 6 with a queen bed. This room can also be converted into an office space upon request for those looking for a private location in the home to work. With 100 feet of your own private beach access and white sand in your backyard, paradise is found. Kailua Beach has been repeatedly ranked among the best beaches in the world. In 1998, it was ranked as the #1 beach in the United States by coastal expert Dr. Stephen Leatherman. Kailua Beach boasts 3 miles of white sand and sparkling turquoise water. Kailua Beach’s proximity to several small islands makes it an ideal place for adventuring, kayaking, and kite surfing. Some guests have even encountered sea turtles swimming by. 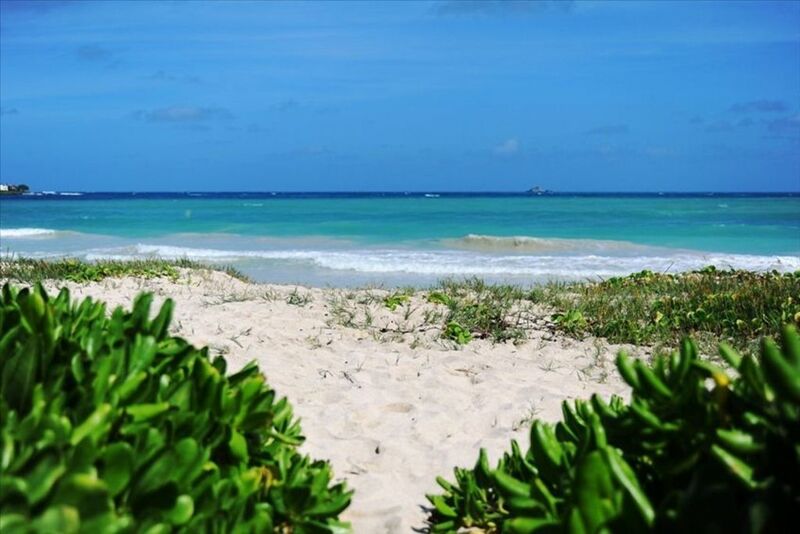 We have a private pathway from our backyard that leads directly to the famous Kailua beach. This part of the beach is primarly very secluded with only a few people at a time. Both our land line and fax line include free long distance calling. Our combination of high-end pillows and mattresses dressed with luxurious 600-thread-count Egyptian cotton sheets ensures that all of our guests get the restful sleep they deserve regardless of what room they sleep in. There is also an alarm clock with iPod connector in every room. We provide fragrance free detergent and laundry softener for all of our guests. The washer and dryer are conveniently located behind the garage which has immediate access to the home. Laundry baskets and hangers are provided in each room. Our home features a gourmet kitchen that will satisfy even the most discerning chef with the latest in high-end utensils and appliances. Top notch appliances include a dishwasher, large refrigerator & freezer, microwave, coffee pot, tea kettle, oven, stove top burners, state of the art knife set, immaculate pots & pans and all the spices necessary to create a wonderful home cooked meal. We even have a state of the art Cappuccino coffee maker with a 3 coarse bean grinder. Enjoy! (6) We have a flat screen TV in every bedroom with free premium movie channels plus a 55' in the living room with DVR capabilities. Beach towels, boogie boards, and snorkel gear are all provided for you. looks beautiful and we would have loved to stay here but mona, debra and ingrid were, by far, the most unprofessional and unorganized people to attempt to do business with. we were told we could book the property and that our travel dates were open, then literally an hour later my phone calls were ignored. i searched the internet finding an alternate phone number finding yet another unprofessional person to deal with. this time i was told the property was 300 more dollars a night then i was originally quoted and it took an entire day to get simple answers to simple questions. if i owned this property i would seriously consider getting a more reputable realtor to handle my business. thankfully we found a property quickly and easily, the way business should be handled. We had 3 generations of our family staying in this beautiful home for my 60th birthday celebration. Everyone loved this quiet, roomy home with the most glorious beach right out the back door. The sunrise views from the living room and master bedroom were amazing. The main living area is HUGE which makes it perfect for families. We never felt crowded. Four of the bedrooms are not directly connected to the main house (you must enter through the pool area) so it was a little concerning at first with small children. But it worked out great and everyone felt like they had a private section of the house. We thought we would have to buy beach and pool toys for the kids, but there were plenty at the house already. The house proved perfect for my family reunion, and everyone is anxious to return. The outside entrances to some bedrooms afforded an extra measure of privacy, and the kitchen was well stocked with utensils, flatware, dishes, and cooking pots. The wine cooler and extra refrigerator was much appreciated. A suggestion of more trash cans and recycle bins is recommended. Let Your Inner Beach Bum Be! Our second stay here was 6 months longs. It seemed like only 6 weeks. The house features a well furnished generous floor plan with great feng shui and a stunning ocean view. It sit on a fabulous beach that is also a world class set up for windsurfing and kite surfing. When the trade winds are blowing, this place "rocks". Launching through the shore break in front is for advanced sailors only. Kailua Beach Park close by, provides a safe alternative. The house is located in the "Castle" area of Kailua Bay that is also a great surfing spot. In a nutshell, we like the property and the people who run the rental outfit it is part of. We will be back. Reservations cancelled 180 days or more from the arrival date are fully refundable, 179-30 days are 50% refundable and anything less than 30 days is non-refundable.